At the Statehouse: Mike Brown, pastor of Franklin UB church (New Albany, Ohio). 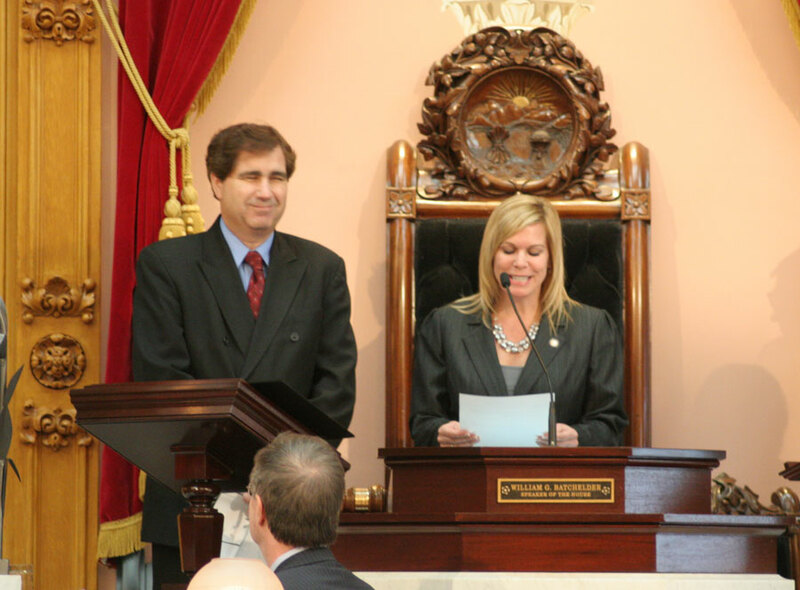 Mike Brown, pastor of Franklin UB church in New Albany, Ohio, gave a prayer to open the Ohio House of Representatives session at the Statehouse on March 27, 2012. He was invited by his state representative. Brown noted that, a couple of years ago, there was a lot of controversy from the Speaker of the House regarding prayer content, including the use of the name Jesus. He was told by an aide to the representative that if he wanted the prayer to be recorded in the official Statehouse history, he had to submit the prayer in writing and get it approved by the Speaker’s office. Dear Father in heaven and over all the earth, we hold this truth to be self-evident: that all men, women, and children are created equal. Red and yellow, black, brown and white, we are all precious in your sight. You love the little children and all the people of the world. I pray today that in Ohio we not only believe but we live our state motto: “With God All Things Are Possible” Your amazing grace has given us this great State and this great nation. One nation under God, we pray that both this state and this nation will always be indivisible with liberty and justice for all. In every hallway, every corridor, in every room and every chamber of this magnificent Statehouse, let freedom ring and justice reign. Guide, guard, and give every State Representative the wisdom to make the best decision for their constituents and for the citizens of the state of Ohio. And while they are here away from their families, making such a great sacrifice, may their families never be away from their heart. Extend your grace to their families and also give their families great patience as their husband or wife, mother or father, son or daughter serves in this important capacity. Throughout all the travel, please be sure to allow them to arrive back home safely. Until the very last day of the 129th General Assembly, may the laws of man always be governed by the laws of God, for you are the supreme Governor of the universe, you are the God in whom we must trust. In the name of the Lord I pray, Amen. 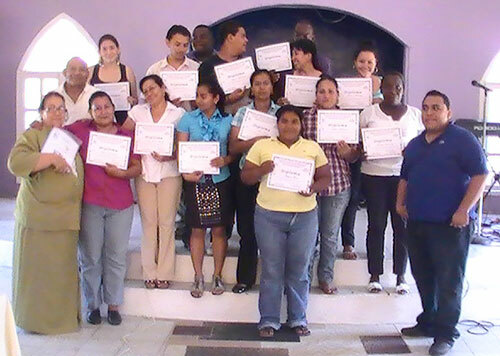 Honduran pastors involved in leadership training. Sunday school teacher training at Puerto Cortes. 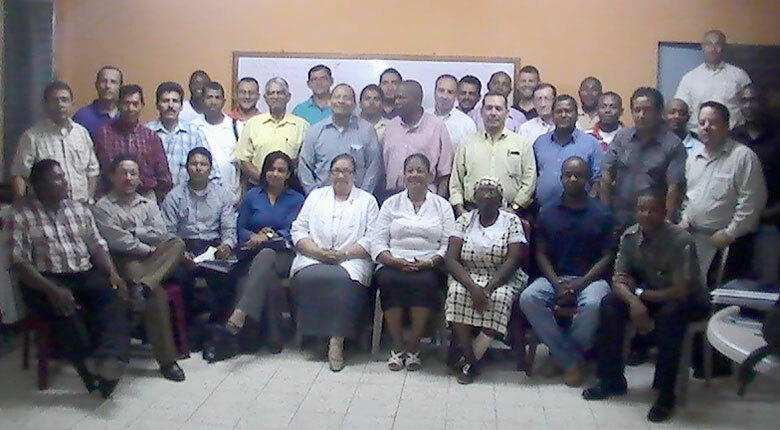 Thirty-two Honduran UB pastors participated in a training event. The conference is training leaders from each conference district using a program called ETBIL (Local Church-Based Theological Education). Thus far, 14 have completed the entire program. Participants meet twice a month, for 6 hours at a time, to work through the units of study together. 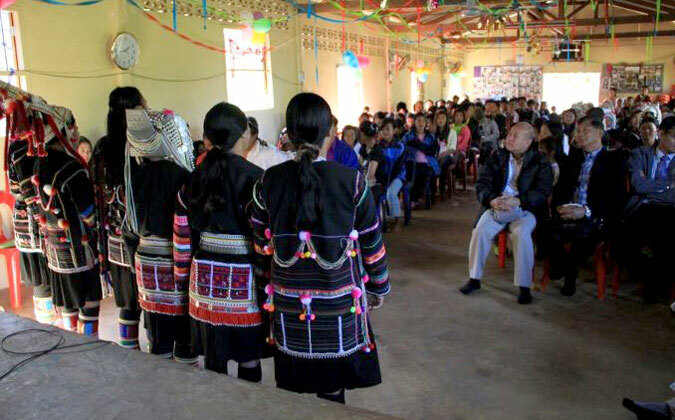 The idea is that this first generation of 14 will go on to train pastors in all districts, and then pastors will provide the same training for their own congregations. “We continue being very focused on preparing leaders,” writes Superintendent Chavez. Honduras has invested tremendous effort over the past three years to provide numerous regional training events of this nature. Many pastors have limited education and theological training. They also are often bi-vocational, so the on-site training is appreciated. Superintendent Juanita Chavez sees this as a high priority, and local churches are experiencing the benefits. In addition, a workshop for Sunday school teachers was held on a recent Saturday in the Wesley Zion Church in Puerto Cortes. As of January 2012, Rev. Gonzalo Alas was appointed to serve only the work in El Salvador and will no longer spend any of his time the El Copan region, where he had previously served as a church planter. Honduras oversees the work in El Salvador, but any gifts from other conferences would always be welcome and can be directed through Global Ministries. A group of students from the Taylor University School of Business traveled to Sierra Leone in January 2012. They taught entrepreneurship skills and other business-related skills to Sierra Leoneans. The team was led by Jeff Sherlock, a former UB missionary and current Global Ministries Leadership Team member. Chad Cazel, a student member of the team, developed this video about the trip. Enjoy. The March 25 fire at the former Conway UB church. The former Conway UB church near Fowlerville, Mich., was destroyed in a fire late Sunday night, March 25, 2012. The building has been home to the New Covenant Christian Church. In the 1980s, the United Brethren congregation relocated into the town of Fowlerville under the leadership of Rev. Steve Malson, and is now the Fowlerville UB church. The church building was constructed in 1888, but the original congregation dates back to 1855. The cause of the fire is undetermined. Six persons are from the United States are now in Sierra Leone, where they will participate in the annual Women’s Institute. Donna Hollopeter, associate director of Global Ministries, and her husband Jason. Penny Cole, pastor’s wife from Park UB in Bluffton, Ind. Matenneh Abu, wife of pastor Joe Abu of Mount Zion United African Church in Philadelphia, Pa.
Two other women from the Mount Zion church. This fall, Huntington University will launch an innovative new program in athletic training. The 3-2 athletic training program starts with three years of undergraduate study at Huntington, followed by two years of graduate work at Manchester College in North Manchester, Ind. Students will emerge with a Bachelor of Science degree in pre-athletic training from Huntington and a Master of Athletic Training degree from Manchester. Huntington University has chosen six incoming freshman to receive the Horizon Leadership Scholarship for the 2012-13 school year. This is the program’s fifth year. The Horizon Leadership Program is a partnership between Huntington University and Youth for Christ with the goal of creating a more racially and ethnically diverse campus. The scholarship covers fees associated with tuition and housing costs for up to 10 semesters through a combination of federal, state, and institutional aid. Recipients are required to maintain a 2.5 grade point average, meet with the director of the program weekly, and volunteer at the Primetime Center in Fort Wayne. Reneson Jean-Louis, from Homestead, Fla., a senior at South Dade Senior High School. He plans to study pre-law at HU. Vanessa Robles, from San Antonio, Texas, a senior at Karen Wagner High School. She plans to study marketing at HU. Brianna Cash, from Lima, Ohio, a senior at Lima Senior High School. She is interested in studying biology pre-med. Mirlyne Charles, from Homestead, Fla., is a senior at South Dade Senior High School. She plans to study biology pre-med. Corean Sanders, from Fort Wayne, Ind., a senior at South Side High School. She is interested in studying graphic design. Madison Rhoades, from New Haven, Ind., is a senior at New Haven High School. She plans to study math education. Earlier this year, Huntington University received a national award for its programs in promoting racial and ethnic diversity. A service in one of our churches in northern Thailand. 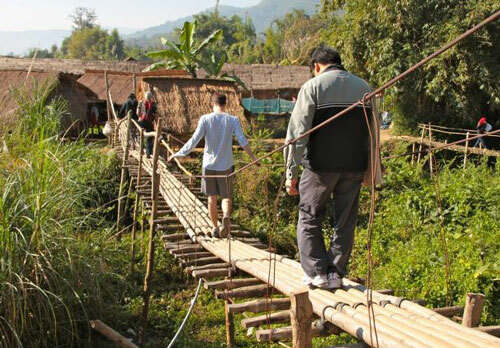 A footbridge into a Thai village. John Netrick with a friend. 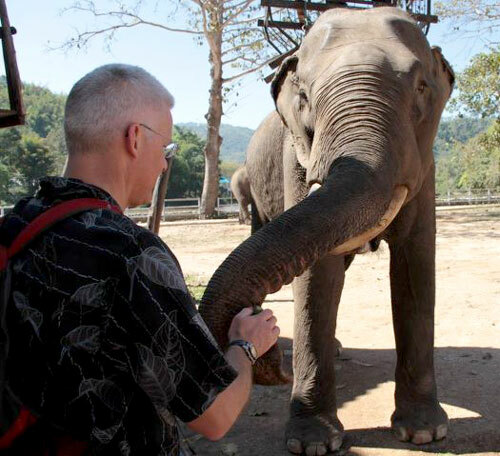 In January 2012, I visited Thailand with three men from King Street UB church in Chambersburg, Pa.–pastor John Beukema, John Hetrick, and Kyle Bushre. We were joined by Carol Chan, who chairs the missions commission for Hong Kong Conference. Global Ministries is interested in ways to partner with Hong Kong Conference to expand our ministry in Thailand. 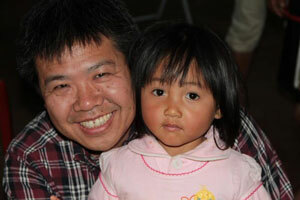 We have effective work in the mountains of northern Thailand–two churches, one church plant, and other ministries. 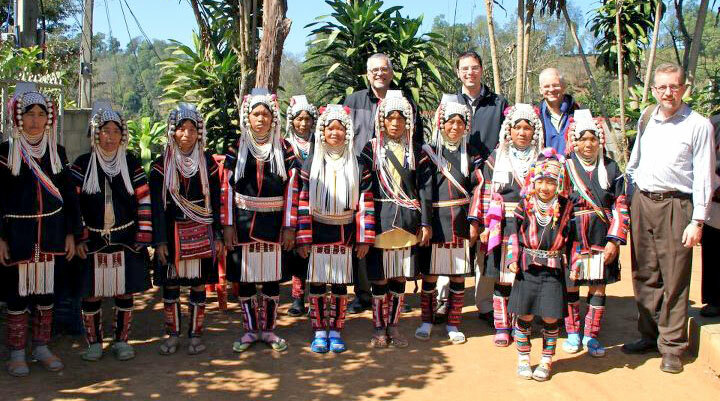 Now we’d like to expand our work into the more populated areas–in particular, the city of Chiang Rai. At the same time, King Street has been looking for a partnership that would enable them to be involved in church planting among a relatively unreached people group. So it was a vision trip for both Global Ministries and King Street. Out of the trip came multiple opportunities. Church planting. The Council of Churches in Thailand has been very generous and open-handed to Hong Kong and Global Ministries regarding any efforts we want to pursue in Chiang Rai. A building now being used by World Vision will become available soon, and they offered it to us. Carol Chan with the pastor’s daughter. Teaching English. A number of countries in South Asia, including Thailand, are working to create a free trade zone. The common language would be English. As a result, those countries are greatly interested in getting their students up to speed in English skills. In Thailand, the government is providing substantial funding to schools—including salaries, housing, and travel costs–to bring in native English-speaking teachers. They are basically waiving the visa process. If you have a contract with the school, whether it’s a secular or private school, you are in. Small business enterprises. Young people from the mountain areas are finding it hard to continue working in the tea harvesting in- dustry and are looking for work in the larger cities. Such persons, sometimes naive, often fall prey to persons who trap them in lives of slavery and prostitution. We’re interested in finding persons willing to expand their businesses to provide training and employment opportunities for these young people. Interestingly, silicon chip manufacturers in Bangkok are looking to expand their operations into the north to avoid the typhoons which often disrupt their operations. This presents both job and church planting opportunities. As you can see, we have some open doors in Thailand. We have a number of offers of assistance and opportunities to initiate a new work, and would be interested in speak- ing with persons possessing relevant skills. As Easter approaches, we select a number of worthy projects we believe will advance the work of Christ. We invite your church to participate in this missions offering. Business as Missions materials. Business as Missions refers to using business earnings to support an individual or group in accomplishing their ministry goals. Global Ministries is training its overseas staff, international church planters, and national conferences in its use. However, our materials are now printed only in English. Your gifts will enable us to translate and print these materials so we can respond to requests for further training and coaching in the Spanish-speaking world. Church planting and construction. We never provide complete funding for a new church, but do offer some assistance to complete buildings where local believers have already bought property or initiated construction. Each project is carefully assessed and funds are provided based on need. In some cases, a work team may be sent. Sierra Leone National Office. Wanting to centralize national leadership, Sierra Leone Conference has been working to renovate their national office building in Bo, which is in disrepair. A renovated national office will bring its key national leaders under one roof, make it possible to offer regular training events, and reduce travel expenses. General Conference, Spring 2013. General Conference, held every three years, brings together leaders from our 10 national conferences. They report what God is doing in their countries, share vision, pray, and develop cooperative strategies to reach our world for Christ. The next General Conference will be held in Canada during the spring of 2013. While each National Conference is asked to pay its own expenses, your gifts help make up for any lack of resources. Mission Team Leader Training. Interest in sending short-term volunteers overseas continues to grow. However, the effectiveness of mission teams often depends on the leadership and preparation of the group. Global Ministries has a short-term mission team leadership workshop that has been offered in the past. We’d like to offer it again on a regional basis. Donations designated for our short-term mission team leadership workshops will cover the printing and preparation of materials and curriculum, travel expenses for the presenters, and some financial assistance to the participants. Ken Williamson has been named senior pastor of Orrstown UB church (Orrstown, Pa.) effective April 1, 2012.